Fully furnished Custom home on the 6th fairway of the Lost Gold Course w/unobstructed views of 2 fairways & mountains. Large private courtyard w/fireplace & Superstition Mtn Views. Beautiful entry w/designer columns & unique 14' ceiling treatments. Travertine floors. Lovely living room w/stone fireplace & wall of windows looking onto the spectacular backyard. Large formal dining area & butler's pantry. Open great room w/breakfast area. Gourmet Viking kitchen w/granite counters, breakfast bar, three ovens, 6 gas burner stove, warming drawer, trash compacter & walk-in pantry. Office w/dual desk, built in cabinets & walk in closet. Four bedrooms each w/their own bath, one located in a separate Casita w/kitchenette. Gracious Master bedroom w/fireplace & separate seating area. Master Bedroom also has vaulted ceilings, tall arched windows and access to the backyard. Coffee bar leads to large Master Bath with a jetted tub & large closet with custom built in cabinets. Relaxing well designed backyard w/heated pool & spa, large covered patio w/BBQ & separate putting green. Great for entertaining & enjoying the beautiful Sonoran desert sunsets with a small twinkling of city lights. 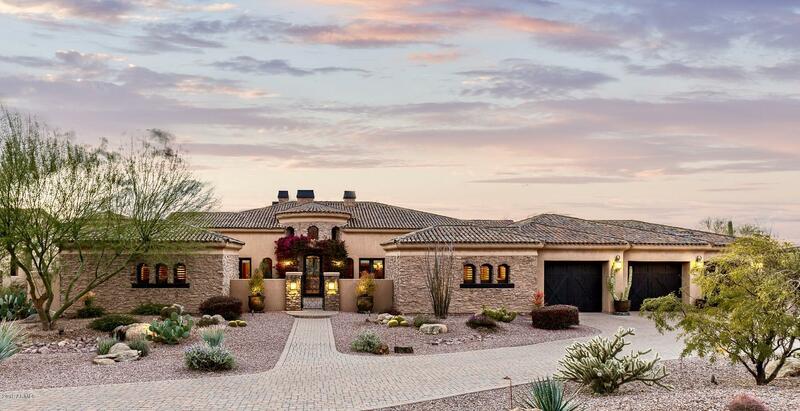 Luxury living by Design in the 24/7 hosted front gate of the private Superstition Mountain Golf & Country Club. Golf club membership by separate agreement features 36-holes of Nicklaus Designed Golf, 50,000 Clubhouse, Health & Fitness, Heated Swimming Pool & Tennis/pickle ball. Only true 36-hole private golf club in central Arizona. Only 33 miles from Sky Harbor Airport. All pertinent information, including square footage to be verified by buyer. *A few items are not included in the furniture and furnishings.